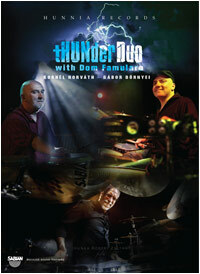 "Two of Hungary's heavyweight musicians, Gabor Dornyei (drums and percussion) and Kornel Horvath team up under the guidance of jazz supremo Dom Famularo. Together they form a barrage of rhythmical explosions guaranteed to have you sitting on the edge of your seat in sheer amazement, at what this gregarious bunch can come up with. Jaw dropping ethnic/world grooves that defy description litter this innovative DVD (now licensed through Hudson Music). Their technical prowess, comprised with a heavy dose of fuel, would floor most of today's drumming alumni-they literally ambush your senses with pugilistic abandon, as they demonstrate their sheer abundance of ideas. A global journey, a diverse diaspora all covered with infectious enthusiasm and masterful technique unlocking creative channels with a whole host of wild and wacky instruments. Totally inspiring ,a musical viagra for the ears! Warning you will be engrossed by this compelling and fascinating duo, scholary but a blast to behold. An astonishing achievement!"